Surrounded by the beautiful snow-and-glacier topped peaks of the Canadian Rockies and just beside the sparkling turquoise waters of a postcard perfect alpine lake, the ski resort of Lake Louise is known for its grand hotel, teahouses and hiking. This is one of those destinations where a photo does more to sell it than an essay of description, but let’s just say that it’s an extremely beautiful natural landscape - the kind of place which can’t help but make you feel grateful to be alive. The best places to stay in Lake Louise are definitely those with the best views. And our Gurus haven’t had too difficult a job choosing their recommendations for the best places to stay in Lake Louise as there isn't a huge range of options. Lake Louise the village isn’t much to speak of, we’re all here for what you’ll find five kilometres away - along the Louise Creek Trail if the bears aren’t out, or in the car if they are. Once you reach the shore of this incredible lake you’ll have a hard time tearing yourself away. But there are more epic views to be seen in from the amphitheatre of mountains behind the lake and yet another amazingly beautiful lake, Lake Moraine, just 13 kilometres away. So hike, climb, snowshoe, or cross country ski about as much as you can to experience the full majesty of this amazing spot. Explore the epic landscape on long hikes. Enjoy the beautifully manicured slopes and excellent ski conditions. Speed through the forest behind a team of huskies on a dogsledding adventure. Find picturesque spots to spend quiet hours fishing. Skate and ski your way along hundreds of kilometers of trails through the breathtaking snow covered mountains. Don't forget that the best places to stay in Lake Louise will be very busy both during the peak winter and summer months. So do yourself a favour and book early! The Post Hotel & Spa is a charming hotel right by the water just five minutes from the Lake Louise ski resort. There are 97 simple yet elegant rooms, many with fireplaces and balconies, plus a choice of restaurants - including a Swiss fondu restaurant and an English style pub. There is an indoor pool. 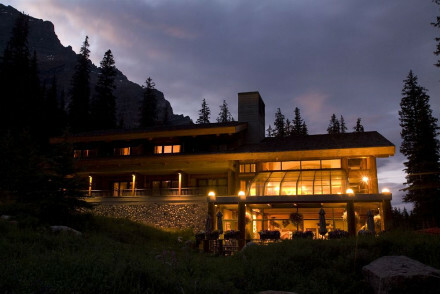 If you don’t mind being further from the resort - or if you’re here to escape - then the Moraine Lake Lodge might be perfect. It’s an upscale resort with 33 rustic rooms featuring handmade wooden furniture. You’ll get amazing views of the Canadian Rocky Mountains and Banff National Park from your private balcony. Peaceful and serene. Calgary International Airport is a 2 hour drive to Lake Louise. There are several car rental agencies at the airport or you can book one of the many shuttles which drop off at hotels in Banff and Lake Louise. Best time to visit - Lake Louise is an all round destination with the changing seasons bringing ideal conditions for various outdoor pursuits. For skiers plan a trip in the winter months when temperature can reach -7°C. The warmer summer months average 20°C and is ideal for hikers. Browse through our list of all the best places to stay in Lake Louise. Expand your search to include all our Alberta recommendations. 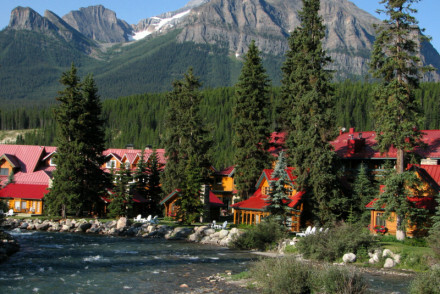 A charming riverside hotel, just five minutes from Lake Louise Ski Resort. The rooms are simple and elegantly furnished, with cosy fireplaces and balconies. A range of on-site restaurants include a Swiss fondue restaurant and an English-style pub, while the cellar boasts some 25,250 fine wines. Back to Nature - From winter to summer there are a whole host of activities that allow you to soak up the great outdoors! An upscale resort nestled under the Canadian Rocky Mountains in Banff National Park. The rustic rooms feature handmade wooden furniture and stone chimney pieces. Private balconies command wonderful views of the lake and surrounding countryside. Peaceful and serene. Restrictions on children - Children older than 8 years are welcome.